Let experts manage your Yahoo! search marketing campaigns efficiently. Professional expertise to give the best out of your search advertising campaigns. Yahoo is not only known as one among the top content leaders in the web space but also continues to innovate in ad formats and monetization opportunities in search in partnership with Bing. It tenders potential advertisers an opportunity to ensure enhanced visibility, increased reach, and improved ROI throughout their business ventures. Being world's leading comparison search site, Yahoo! 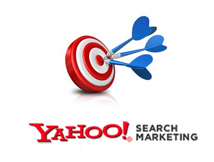 turns Yahoo Search Marketing an important component to serve online advertising campaigns. Its hight time to promote your products to millions of motivated buyers as Yahoo! and Microsoft are working together to bring-in a new dimension in search advertising. BrainPulse enjoys enormous expertise and skill set in offering Yahoo search marketing PPC campaign management services and tracking to its global clients. We accommodate a highly competent team search marketing professionals who analyze your business and the context of the industry and then target keyword phrases to obtain the maximum result. This expertise finally results successful Search advertising campaigns for our valued clients. Our customized and highly affordable Yahoo Search Marketing services it gives online businesses definite ROI through generating high quality traffic. Our PPC experts help you to successful manage your Yahoo Pay per Click Campaign and help you to reach on top.